In today’s world, it’s vital to efficiently exploit your company’s data to manage, anticipate, and analyse your performance in order to make the right decisions. The BI (Business Intelligence) tool offered by Cap Vision will enable you to gauge different performance indicators to get an understanding of your company’s past, analyse its present, and visualise its long-term future. More simply put, BI involves implementing a range of tools and techniques to collect, sort, and enrich structured data for storage in an SQL database. Cap Vision will support you in choosing and implementing a business intelligence tool including Microsoft tools such as Power BI, Office 365, and Visual Studio, amongst others. Cap Vision’s Power BI offer can be adapted to suit your company as part of a BI solution. 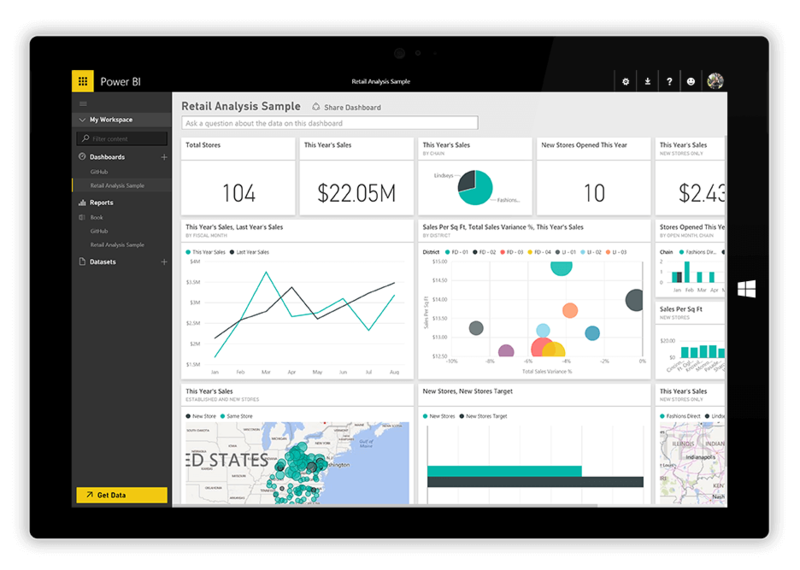 Power BI is Microsoft’s business intelligence solution. It can be used to analyse and visualise your data using enriched dashboards. Users can access an overall view of the most important measurements of their business activity and real-time updates on all of their devices. With an ergonomic interface and interactive reports, the intuitive Power BI tool is the right analytics solution for your company. All employees can publish reports and share important information in a secure environment. The Power BI business intelligence tool is the key to improving business performance and reducing your margins of error.